The moment Reid was born, the Underwoods could sense that something was very wrong with their son. Audra remembers seeing him being carried across the room and noticing blood on his arm and leg. Distraught, she kept asking Brian why no one was wiping the blood off. When her husband relayed her question to the doctors, they responded that it wasn’t blood. When he asked what it was, they said “I don’t know.” Brian looked over their shoulder at his newborn son, and the color drained from his face. 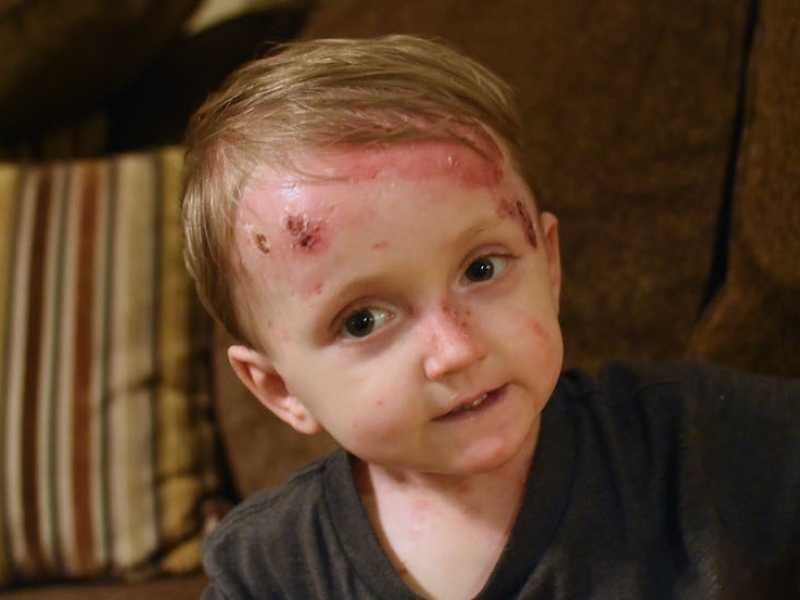 Reid was missing skin on roughly 40% of his body. What was supposed to be one of the happiest days of their lives quickly spiraled into the most terrifying. Doctors were walking around with medical textbooks open, trying to diagnose why this baby was born without skin. 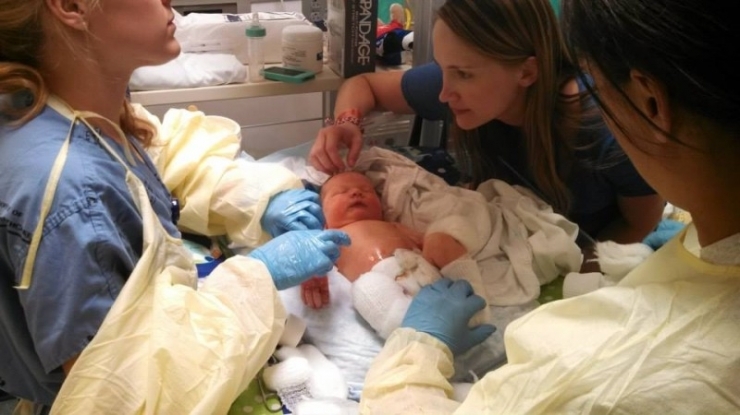 They rushed him to the NICU, where he was then transferred to another hospital. 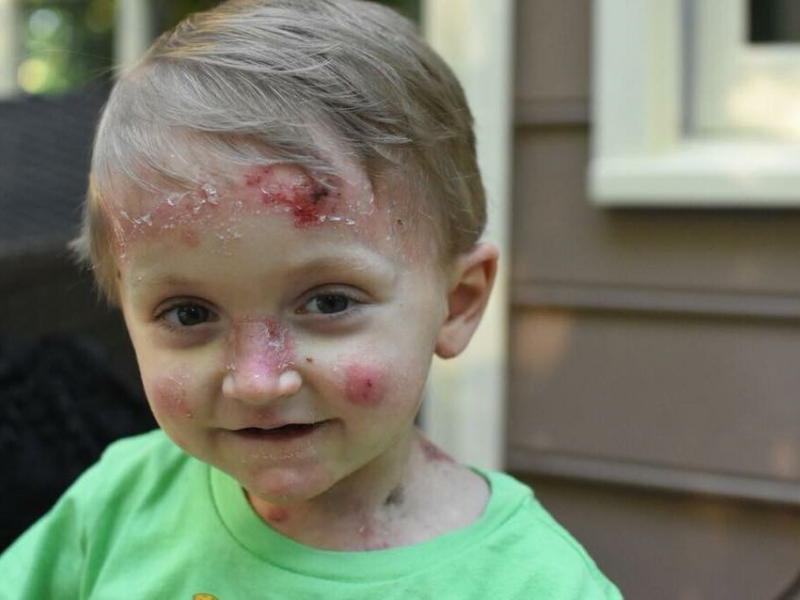 It was there that Reid was diagnosed with Epidermolysis Bullosa. 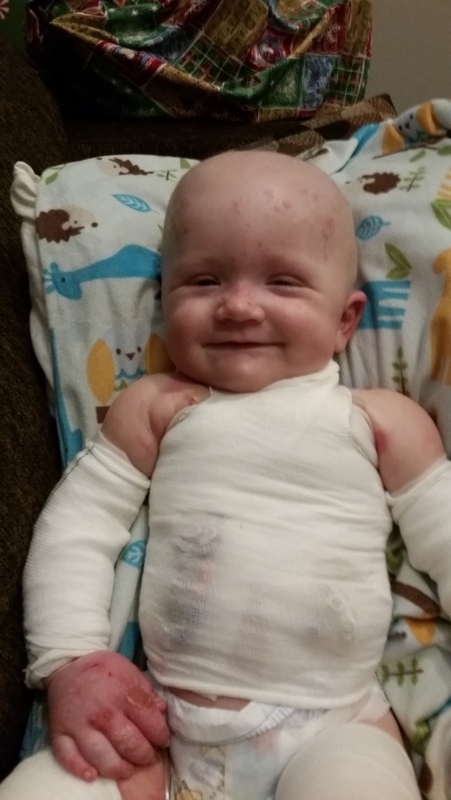 The chances of getting the kind of EB Reid has – Autosomal Recessive Dystrophic Epidermolysis Bullosa – are literally one in a million. This strain of EB has a motto, and it’s “The worst disease you’ve never heard of.” The amount of pain Reid endures, every second of every day, cannot be overemphasized. He is on a constant cocktail of morphine and oxycontin. He is always at risk for staph infection, although he has already contracted several, because his body is covered in open wounds. The disease doesn’t just affect him externally. It wreaks havoc on his internal organs as well. Sometimes Reid will get corneal abrasions from blinking. The blisters cover his lips and mouth so he cannot enjoy eating, and when he swallows he sometimes scratches or rips the skin in his throat. When Audra pops his blisters, Reid looks at her with desperation as he screams out in agony. As a mother, she knows that she has to torture her son to keep him alive. But she also knows that she wants more for him than the life he is living. He deserves more than to just exist. So Brian and Audra made a drastic decision. They had heard of a doctor who conducts bone marrow stem cell transplants on children like Reid who suffer from EB. His information was not public so the couple had to seek him out. He is the only doctor in the world willing to operate such a dangerous procedure – and the mortality rate was startlingly high. Essentially, what Reid needed was collagen VII. Collagen VII is responsible for holding skin together, and his body didn’t produce it. If he was accepted for the transplant, Reid would endure half of a chemo cycle and one session of radiation, with the hopes of killing off his existing cells in his bone marrow. Then, they would transplant the donor’s healthy bone marrow cells into Reid’s and cross their fingers that the operation works. The only thing they needed now was a match. Although his mother and father would give anything to be donors, they are carriers for this horrifying disorder, which renders them ineligible. They had two choices: attempt to find a match in the Universal Donor Bank, or have better chances testing Reid’s siblings. Because Barrett and Avery both share Reid’s DNA, the logical step seemed to start there. But they are young, only 3 and 5 years old. They wanted to be tested anyway, and his sister Avery, 5, was a match. The couple struggled to accept that two of their three children were about to undergo a dangerous, invasive transplant. There were countless things that could go wrong. But this was a family of fighters, and they were not going to stop now. 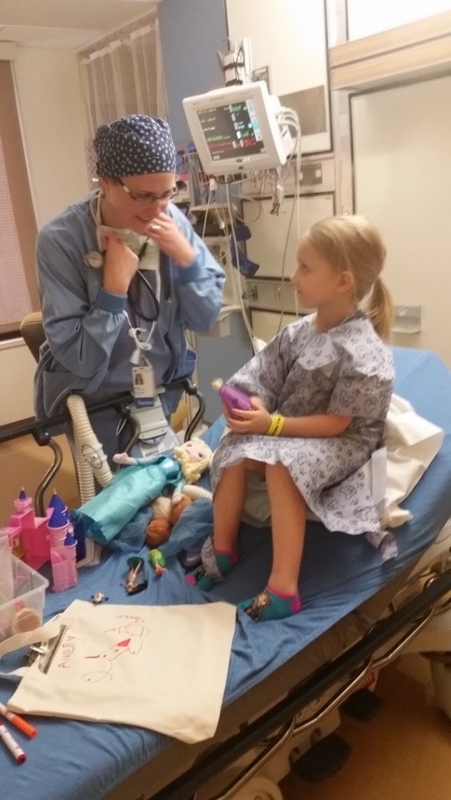 Audra and Reid flew up to Minnesota to prepare for the transplant, followed by Brian and Avery. Although being a donor is both dangerous and excrutiating, Avery didn’t for one second doubt her decision. After the transplant, Reid and Audra stayed in Minnesota, thousands of miles from home. They have been there for seven months, and are still separated from their family. Although this is an enormous sacrifice, it shadows in comparison to the lengths they would go to to improve Reid’s quality of life. 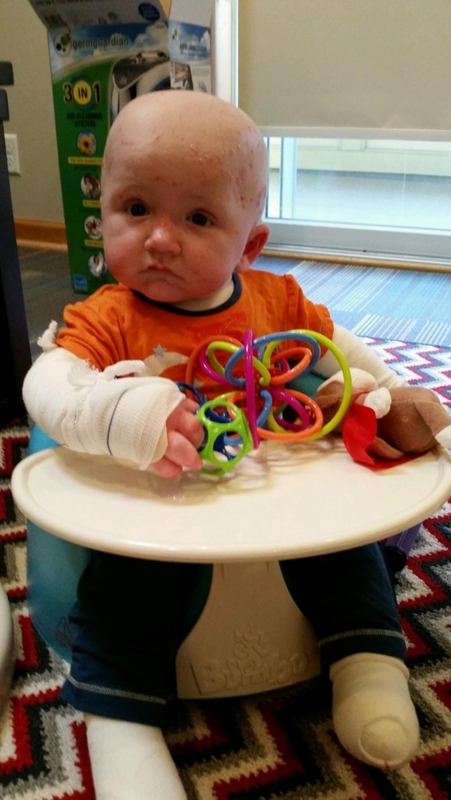 In preparation for Reid’s return home, the family knew there were large-scale modifications they needed to make to their house in order to foster an environment where he could begin to feel independent and safe. 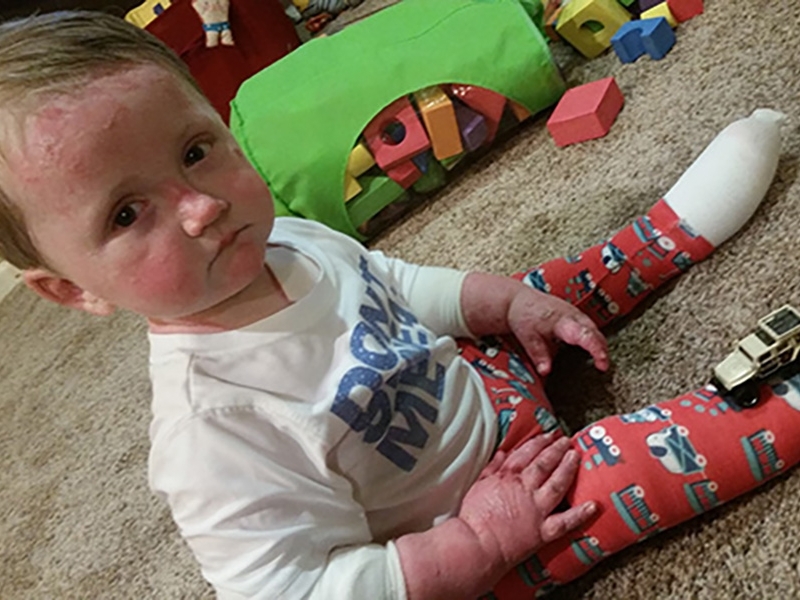 They researched custom carpeting that was so soft Reid could learn to crawl on it without causing painful blisters. They found a device that would raise the acidity in his bath water so they would no longer have to bathe Reid in bleach and vinegar. The Underwoods found an Ameribed that would keep Reid comfortable while he slept, an Air Conditioner/Dehumidifier that would help his skin, a specialized bathtub that would substitute holding him over the sink, and custom clothing designed to allow wounds to breathe and heal faster. They knew these items would instantly improve Reid’s daily life, but they had already put every dime they had into this expensive transplant. This is the part where Chive Charities comes in. 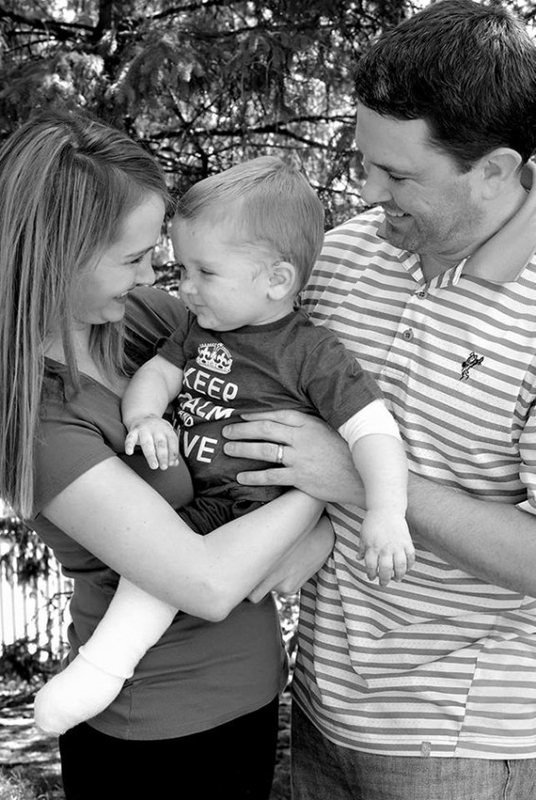 After hearing about what we do for the underdog, Audra and Brian knew if there was any charity that was going to step up for their son, it was us. They were right. With a $30,000 grant from Chive Fund, the Underwood’s list was covered. Although these items will certainly change Reid’s life, it’s not because of the dollar amount. This grant will change his life because when he’s older he will know that somewhere in the world there was a large community of misfits who would stop at nothing to fight for the best possible life for him. 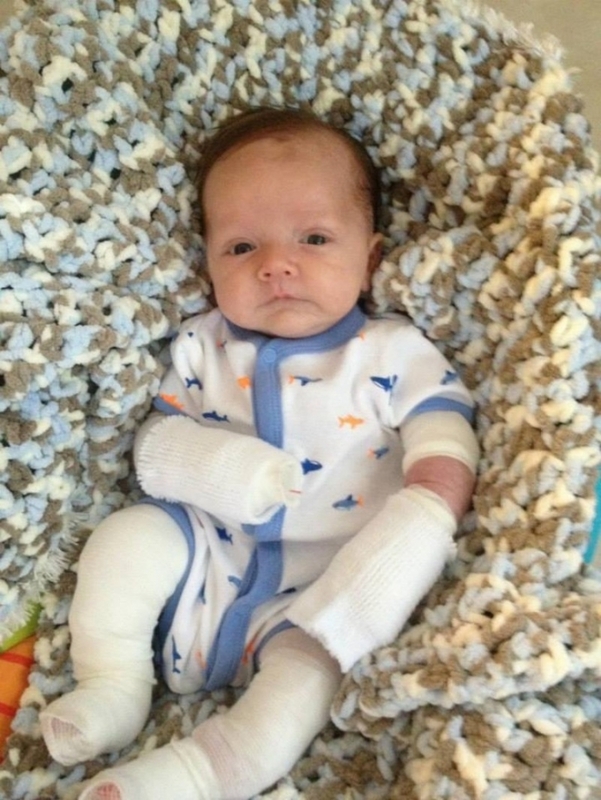 Reid had to stay in the hospital for the first two weeks of his life. 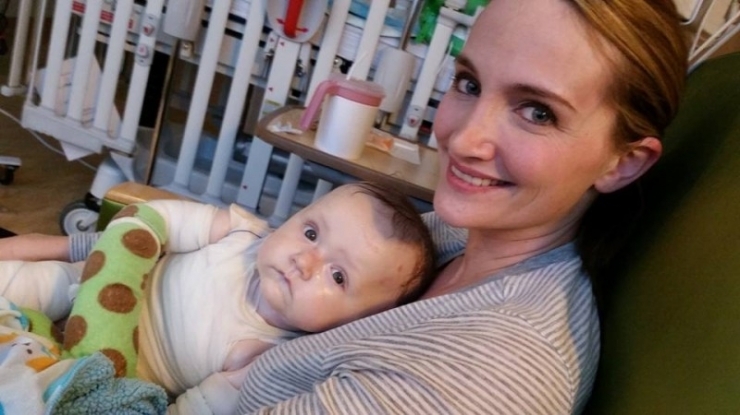 It was within the walls of this room that Audra and Brian went from never knowing this disease existed to learning everything about what plagued their young son. From the very beginning, Reid’s hands and feet have had to be bound to prevent injury. This precaution renders them useless, and if nothing changes, he will always be completely dependent on his parents. Here are Audra and Reid in Minnesota, where they’ve been for the last 7 months. Brian flies up once a month to see them but is busy taking care of their other two children and working a full-time job to provide for his family. 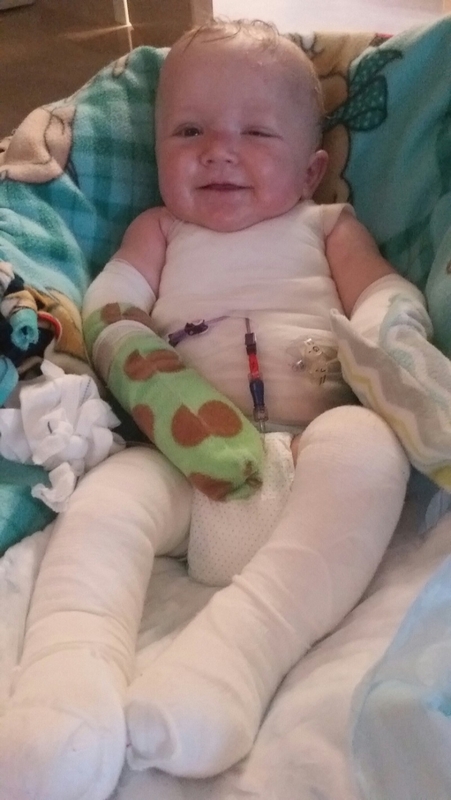 Through all the pain… he finds something to smile about. EB doesn’t affect those who have it cognitively whatsoever, and Reid is an exceptionally smart little boy. He is also curious, mild-tempered, and happy despite everything else. 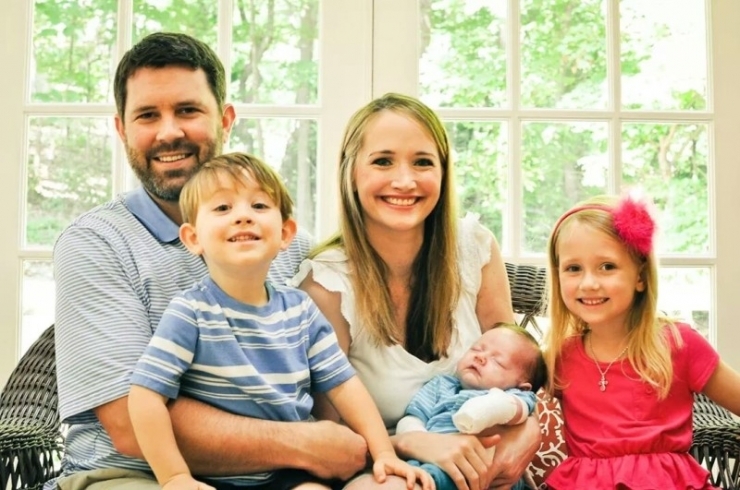 From left: Brian, Barrett, Audra, Reid, and Avery. Soon this family will reunite after spending almost a full year apart. Here is Avery before the transplant. She was a brave girl as the doctor explained to her what would happen. 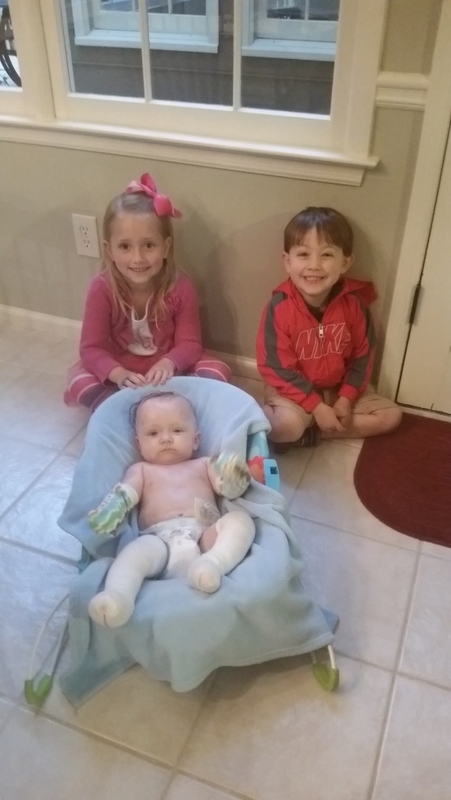 She wanted nothing except to help her baby brother. 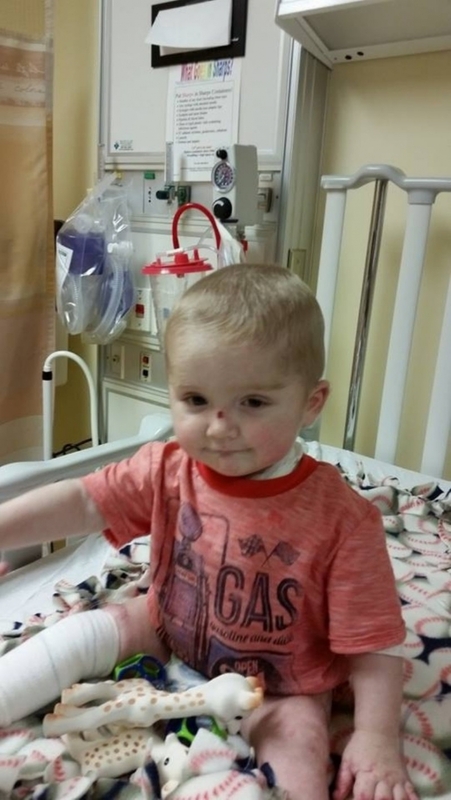 Between check-ups, infections, and millions of doctor's appointments - Reid is a brave boy as he endures hospitalization again. He is essentially living at the Minnesota hospital. Hopefully for not much longer. Here are the three remarkable Underwood children: Avery, Reid, and Barrett. Nothing is quite as tenacious as a sibling’s love. Reid’s story is not close to over. There is no long-term data on the success rate of this surgery because it has only been performed on 30 children worldwide. Hopefully, within a year Reid’s body will start producing the collagen his skin so desperately needs. Until then the Underwoods will continue to do what they’ve done since the day Reid was born: try and make each of his days count. There are many things we don’t yet know. The things we do know are that Reid’s life will be easier, safer, and more comfortable from now on with the items purchased from the $30,000 grant. We also know that he is very, very loved. By his sister Avery, whose selfless sacrifice spoke more than words ever could. By his family. And by us, the Chive community. Our members who donate monthly are the heroes behind every story. Nothing we do would be possible if not for them. Find out how to become a #ChiveCharitiesMember HERE.